Does the thought of taking the GED Social Studies Test send shivers down your spine? Fear not! 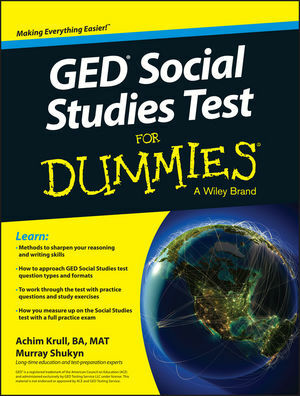 With the help of GED Social Studies Test For Dummies, you'll get up to speed on the new structure and computer-based format of the GED and gain the confidence and know-how to pass the Social Studies Test like a pro. Packed with helpful guidance and instruction, this hands-on test-prep guide covers the concepts covered on the GED Social Studies Test and gives you ample practice opportunities to assess your understanding of Civics and Government, History, Economics, and Geography. Designed to test your understanding of the fundamentals of social studies reasoning and the ability to apply those fundamentals in realistic situations, the GED Social Studies Test can be tough for the uninitiated. Luckily, this fun and accessible guide breaks down each section of the exam into easily digestible parts, making everything you'll encounter on exam day feel like a breeze! Inside, you'll find methods to sharpen your vocabulary and writing skills, tips on how to approach GED Social Studies Test question types and formats, practice questions and study exercises, and a full-length practice test to help you pinpoint where you need more study help. Even if Social Studies is something that's always made you wince, GED Social Studies Test For Dummies makes it easy to pass this crucial exam and obtain your hard-earned graduate equivalency diploma. Achim K. Krull, BA, MAT has taught at both the high school and adult education levels and has written textbooks and other learning materials with Murray. Murray Shukyn has taught at the elementary, secondary, and university levels and is acknowledged as a leader in the field of alternative education.